2012 Bay Mare 16hh approx. WB X TB with straight, athletic, strong and expressive paces and is bred to jump. Her sire, Z.Concorde, is by Concorde out of Lentefee, a mare by Ramiro Z. The breeding is strong down her dam’s side with her mother by JP Magna, grade A show jumper, whose father , Graf Magna, was an Advanced Dressage horse. She is built and bred to jump and her father jumps 1.40 without thinking she could do any discipline as she has the powerful bottom to jump, the paces for dressage and the TB in her to event. Lightly backed, and proving straight forward. She is showing some incredible talent. 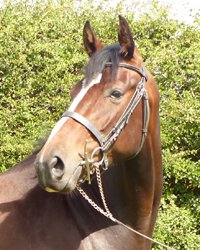 Knowledgeable loving home important for this quality horse who will give you her all, reasonably priced to the right home. All flu tet and wormed regularly. More pictures and video available on request. Pennineview Jubilee - 2012 WB x Dark Bay Mare. An powerful modern sport horse with great proportions, movement and poise.